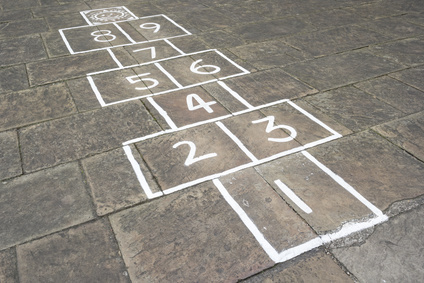 If you practice a hopscotch client retention strategy, do not get your hopes up. Making clients successful is hardly child’s play. Co-partnering in your client’s success involves more than adhering to a mostly-linear protocol. Rather, start by being better prepared to weigh risks against opportunities. As a result, serve your clients better and better over the duration of your relationship with them. When your organization embraces a hopscotch client retention strategy, you color within the lines. With a little, but rigid, jiggle and wiggle every now and then. Yes, I know. Perhaps solutions are strictly bound by the confines of your technical, engineering or scientific discipline’s formulae. Then again, when customer conversations stray dangerously close to the constraints of what is comfortable, why not at least pursue what just might be possible? If not today, tomorrow? When your sales CRM tells you what the next step to close the customer should be, do you ever ask yourself whether this step makes sense? At this particular time? Based on the quality of customer insights you have gleaned by going off-script in your conversations? Or do you automatically follow what the system tells you to do next? Reinforcing a hopscotch client retention strategy reinforces “the same” rather than providing the palette for innovation. While you and your organization are busy jumping around, head down, following precise and strategic steps, your clients are overwhelmed. Overwhelmed by their own conundrums. Underwhelmed by your organization’s inability to serve them. Sometimes what you are selling has absolutely nothing to do with the root cause of the factors holding an organization back. From customer success. While you are busy rushing off to design a solution, based on what you heard the client “say,” you shut down your brain from listening to the rest of the conversation. Which revolves around what they actually dream of doing. When you implement out-of-the-box software solutions to serve specific needs, are you limiting your focus? Would a more robust solution better serve the entire organization, over time? Acquiring and retaining customers is not a game, although executing strategy often is frustrating. Ultimately, if customers are not successful as a result of your placed solutions, they will defect. Or, worse yet, their businesses will fail to thrive. Do you plan to keep your head down, gazing at your organization’s hopscotch client retention strategy? Is it time for you, and your organization, to create a larger framework for executing that strategy? For your customer’s success, primarily? And for your own success, as a result? What are your next steps? Move one millimeter beyond a comfortable client retention strategy, towards what is Possible. Today and Tomorrow. How? Babette Ten Haken’s One Millimeter Mindset™ speaking programs showcase how collaboration catalyzes purposeful personal development and business growth in today’s digitally transforming B2B and B2C environments. Create a more engaged and profitable workforce relentlessly focused on customer success and customer retention. Babette Ten Haken is a STEM design thinker, Six Sigma Green Belt and Voice of the Customer facilitator, forged by her background in new product development, startups, market research and sales. She is a member of SME, ASQ, SHRM and the National Speakers Association. Her professional speaker profile appears on the espeakers platform. Babette’s Playbook of collaboration hacks, Do YOU Mean Business? is available on Amazon.com.